Lambeth will officially be a 20 miles per hour borough from the end of April 2016. 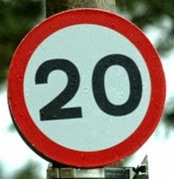 Over the past few months 20mph signs have been installed around the borough and the formal traffic management orders have been passed. The new speed limit applies to Lambeth borough roads only – the Transport London roads such as Brixton Road, Streatham High Road and Clapham Road are not subject to the speed limit. The Clapham and Brixton town centre sections of the A23 and A3 are currently undergoing an 18 month 20mph zone trial which we hope will become permanent. Lambeth Cyclists welcomes this move as we believe that it will make the roads safer for all cyclists and pedestrians in Lambeth. It will also make Lambeth a better place to live.